Ideal for radio broadcasting studio, voice-over sound studio, stages, and TV stations, etc. YOU CAN NOT MISS IT! 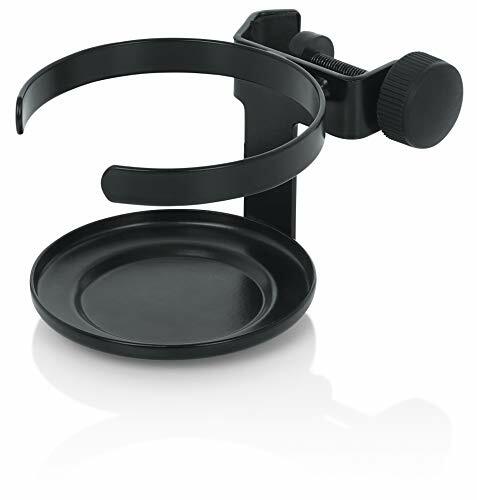 The Scissor Arm Stand is equipped with super-strong spring so that it can stand much more weight. Your microphone is held safely and firmly on this scissor arm microphone clip. The double-braced arms add strength. Extend up to Approx.31.5"/80cm. PLEASE NOTE: Max. Microphone Clip Diameter is 1.26"/32mm and Max. load is approx 1 kilogram; Microphone and Filter Shield Mask NOT Included; The Stand is NOT Suitable for Blue Yeti USB Microphone. 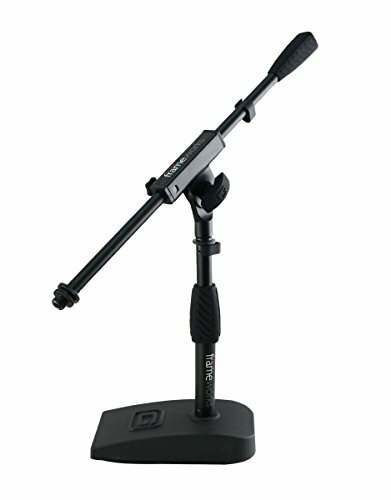 Compact microphone stand designed for heavy duty carry. Suitable for any stores, families, stages, studios, broadcasting and TV stations, etc. Completely flexible, firmly attach the microphone anywhere. Upgraded Desk Mount: Compared with old versions, this zinc alloy desk mount is built with anti-scratch pad and wider mouth up to 1.85 to fit most desktop. The Diameter of Microphone Clip is 1.10. Suitable for any stores, families, stages, studios, broadcasting and TV stations, etc. Attach your Blue Snowball with the 5/8-27 male to 3/8-16 female threaded screw adapter. Note The mounting hole on the Yeti Mic is sometimes just a tiny fraction bigger than the 5/8'' industry standard. Suggestion: Please use Thread Tape (not included) to wrap around the mounting screw on your shock mount, effectively increasing the thickness of the mounting screw, while still maintaining the actual screw thread, so you can connect your Yeti. STABILITY & SAFETY - Dual suspension springs on each boom arm, protects microphone from shaking, suddenly dropping and making noise. Comes with one table mounting clamp, an adjustable positioning screw, can easily clip to any desktop up to 2.15"/5.5cm thick. With this you can easily mount it on your table without any other accessary. The table mounting has a layer of sponges to maximize protect your desktop. Added with soft mat or rubber washer it can avoid damaging your furniture. ALL ZINC ALLOY CONSTRUCTION - Compact microphone stand is designed for heavy duty carry, the adjustable scissor arm stand is made of high quality steel frame and electrostatic powder spraying tech, sturdy, antirust and durable. Load:More than 70.67oz/2KG. Arms are lightweight, completely flexible and convenient to carry, firmly attach the microphone anywhere. FOLDING TYPE - With two 14.5/36.83cm adjustable legs, the stand can be extended up to 27.6/70cm. 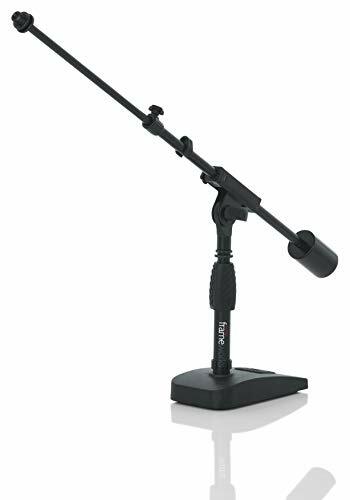 Match with the swivel table mount and adjustable mic mount, you can easily adjust the mic to the suitable angle or height to show your perfect voice. Arm bends back and forth at the base, movement is solid and smooth. It doesn't dip or sink. UNIVERSAL DEGREE - The diameter of ABS plastic clip mic holder is 1.77''/4.5cm, with the brass screw adapter, the mic stand can attach your Blue Snowball & Blue Yeti and fits most of the microphones on the market. Suitable for any stores, Voice-Over ASMR sound studio, Youtube/Facebook Video recording, radio broadcasting, desk, table, TV stations, restaurants, battle station, stage and family performance, etc. Cooperate with the pop filter(not included), the effect will be better. It doesn't matter if you're a recording artist, a news anchor, a YouTuber, or just in need of a quality adjustable microphone stand- the Ohuhu Mic Stand is the perfect choice. 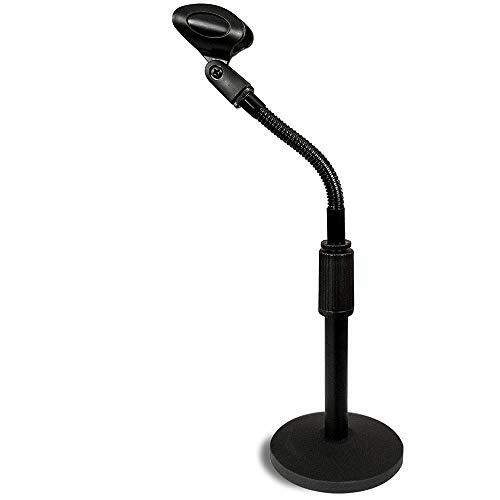 This amazing mic stand is crafted from top-of-the-line painted steel that's both long lasting and lightweight. The Ohuhu Tripod Microphone Boom Stand can be adjusted between 29- 52 inches tall, and the arm is fully rotatable. Each order includes two universal microphone clips to keep your mic securely in place. Need to set it down on an uneven surface like a hill? The telescopic legs can be adjusted individually stay upright on all terrain. Heading out? This studio mic stand is completely collapsible! Simply release the clamp, fold up the mic stand, and take it with you wherever you go. It's ideal for recording studios, radio stations, stages, music practice rooms, and so much more. -Product dimensions: 3.4" x 3.4" x 27.2"
 COLLAPSIBLE & LIGHTWEIGHT: The Ohuhu Microphone Stand is the perfect blend of quality and portability. The premium painted steel will last through years of continuous wear and tear and is light enough to take on the go! Low on space? No problem. This tripod boom mic stand folds flat for easier transportation.  TELESCOPIC & ADJUSTABLE: Thanks to its telescopic and rotatable design, you'll be able to adjust this studio mic stand just the way you like it. 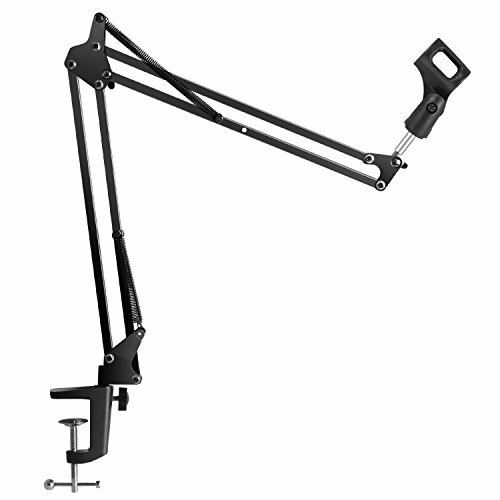 The quick release clamp shifts the boom mic stand's height from a compact 29 inches to a towering 52 inches, and the arm can be lifted as high (or as low) as you please.  2 UNIVERSAL MIC CLIP HOLDERS: Two is better than one. That's why this tripod microphone boom stand comes with two clip holders! Just attach them to the microphone stand, insert your mic, and start recording.  ENDLESS POSSIBILITIES: Recording studios? Check Stages? Sure. TV stations? Why not! This tripod boom mic stand is ideal for a wide variety of uses.  STABLE ON UNEVEN SURFACES: Irregular surfaces are no match for the Ohuhu Boom Mic Stand. Each leg can be adjusted individually, guaranteeing a stability no matter the terrain. Better still, the adjustable mic stand's rubber feet minimize vibration and keep your floors safe from scuffs and scratches. [Professional Accessories] Set of NEUMA upgraded microphone stand and pop filter designed for professional recording and broadcasting work. Compatible with all kinds of microphones including Blue Yeti microphone. 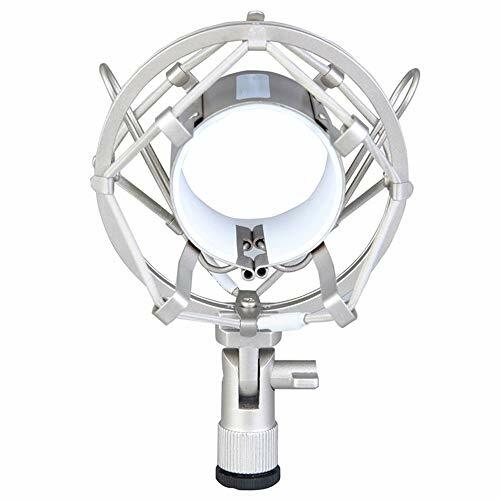 [Made with Heart] Adopts better material the stand itself is heavier than other cheap mic stands which improves its load bearing and makes it strong enough to support heavy mics. Pop filter helps to avoid noise during recording. 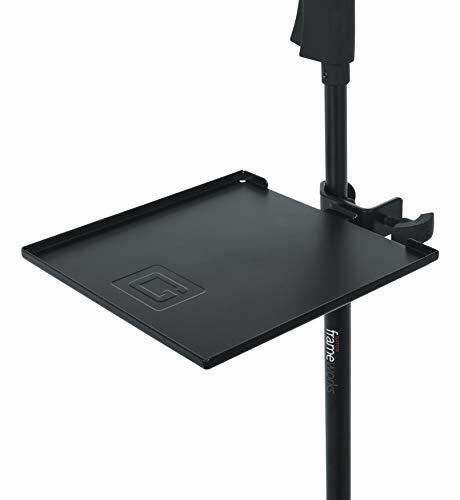 [Flexible and Portable] With two 14.5/37cm adjustable arms the stand can be bent in portable size which is easy to carry or store. [Think for You] Package comes with a table clamp which has dual soft mat to protect your furniture (shows in the pictures) and a microphone clip for traditional dynamic microphones (no need to use the clip if attach other microphones). [Please Attention] The mounting hole on the Yeti Mic is sometimes just a tiny fraction bigger than the 5/8'' industry standard. Suggestion: Please use Thread Tape (included) to wrap around the mounting screw on the stand which will effectively increasing the thickness of the mounting screw so you can connect your Yeti. 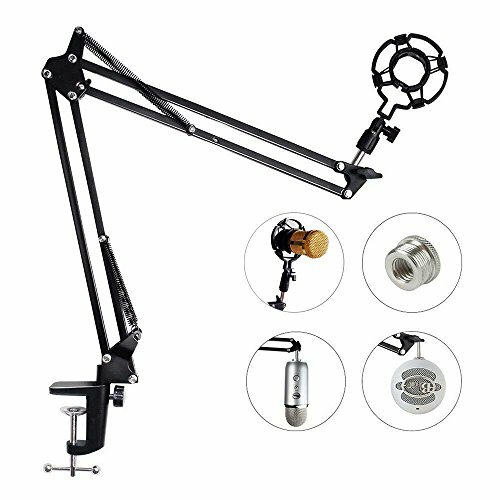 Description InnoGear microphone scissor arm stand is suitable for any stores, families, stages, studios, broadcasting and TV stations, etc. It is made of high quality iron frame. Max load: 2KG. Movement is solid and smooth without any metal noise. Specification Single stand length: 19inch (48.3cm) Square pipe diameter: 0.53inch (1.34cm) Maximum clamping thickness of the base: 1.97inch (5cm) Maximum vertical height: 33.5inch (85.0cm) Maximum horizontal height: 38.0inch (96.5cm) Maximum weight: Max 2kg (4.4lb) Specification of connecting rod connector: 5/8" Material: Iron Package Included 1x InnoGear Spring Built-in Microphone Stand 1x InnoGear Desk Mounting Clamp 5 x Velcro Ties 1 x User Manual Note 1 The base can only be clamped on the flat edge of the table, otherwise it cannot be fixed, it will damage the stand and microphone. 2 Test that you have mounted the clam securely by seeing if you can pull it off the edge of the table. 3 When you need to rotate the stand, first loosen the fixing screws on the side of the base, rotate the stand to the desired direction, and then tighten it again to avoid scratching the pins on the stand. 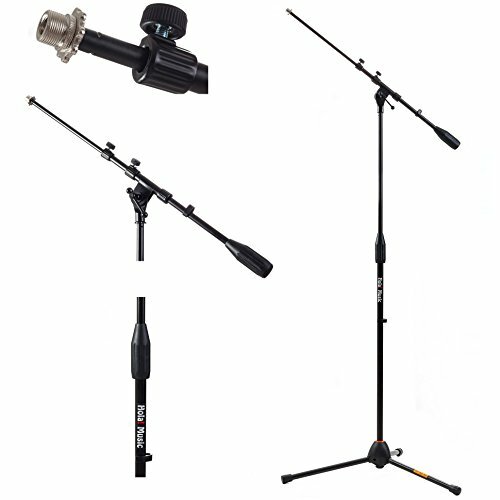 All-In-One Combo: Package includes all the items you need for studio recording and live sound, a microphone stand, pop filter and 6.6ft male to female XLR cable. Pro-grade Male to Female XLR Cable: 6.6ft mic cable is constructed with copper braided shielding provides maximum cancellation of hum and noise; Polyethylene insulation improves high frequency response. Heavy duty metal connectors with molded strain relief and grip treads increase durability and help easy plugging and unplugging. Heavy Duty Construction Mic Stand: Super-strong spring protects microphone from shaking, suddenly dropping and making noise. Comes with one table mounting clamp with protective layer of sponge, an adjustable positioning screw, can easily clip to any desktop up to 2 thick. The Gator Frameworks GFW-MIC-0821 short microphone stand with a weighted base is the perfect multi-use mic stand for recording or live sound applications. The weighted base is useful when using heavier mics that need additional balance. The Gator Frameworks short microphone stand can be used for floor applications such as kick drum / bass drums, guitar amplifier cabinets, bass guitar amplifier cabinets, snare or tom bottom, keyboard amplifiers, theater, boundary, and many other applications. 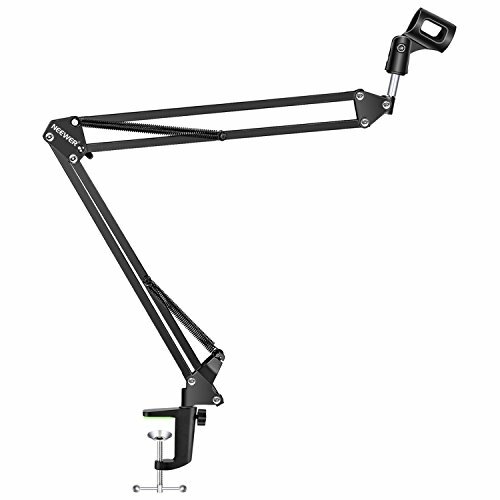 The GFW-MIC-0821 includes a 16 single section boom arm, twist clutch height adjustment, cable management clip and a no slip, vibration reducing gasket. The Frameworks GFW-MIC-0821 also fits both U.S. and Euro size standard microphone clips. The GFW-MIC-0821 has a maximum height of 23 and is constructed of heavy-duty steel and soft rubber twist adjustment knobs for added comfort while loosening and tightening. The base dimensions are 4.5 X 8 . Gator Cases is known for manufacturing innovative products designed to protect! We offer a wide range of available sizes, materials, and protection levels, for all types of instruments and gear including Frameworks stands, Rackworks install racks and accessories, and Protechtor drum cases. It isn't hard to find a great reason why Gator should be the brand you trust to protect your equipment for life! You are sure to get sturdy support and durability with this patented microphone stand. The ergonomic center clutch allows for easy height adjustment anywhere between 40 and 63 inches. This makes it ideal for any live situation, whether you are sitting or standing. It has a Euro-style metal telescopic boom, which means it has separate clutches for the length and the angle of the boom. The end of the stand has standard US 5/8-27 threads. 2 Clip-on cable holders are included. As always, with Hola! you get quality AND affordability! Hola! Music guarantees quality and affordability. Hola! - Say Hello to Music! Gator Frameworks GFW-SHELF0909 Small microphone stand clamp-on Utility shelf is perfect to hold small accessories like capos, harmonicas, and cell phones. The 9 x 9 surface area provides plenty of space while the raised lip around edges prevents items from sliding off. The GFW-SHELF0909 Shelf fits any tubing up to 40mm thick. The steel construction and sleek black, powder coated finish provides a clean appearance. Load up the Gator Frameworks GFW-SHELF0909 Shelf with all of your accessories up to 10lbs. Following the success of the GFW-MIC-0821, the redesigned GFW-MIC-0822 provides a heavier, more stable base for supporting larger mics. At full extension, the GFW-MIC-0822 can hold up to 1.5lbs. It also comes equipped with a 2.5lbs counterweight to offset heavier mic loads. The stand s low-profile range and weighted base provide the ideal solution for desktop recording scenarios, such as podcasts, broadcasts and quick vocals, as well as floor applications for miking kick/bass drums, guitar/bass amplifier cabinets, tops and bottoms of snare drums, keyboard amplifier speaker enclosures, and many more. The compact base helps to reduce the stand footprint in tight-space situations, both in the studio and on stage. 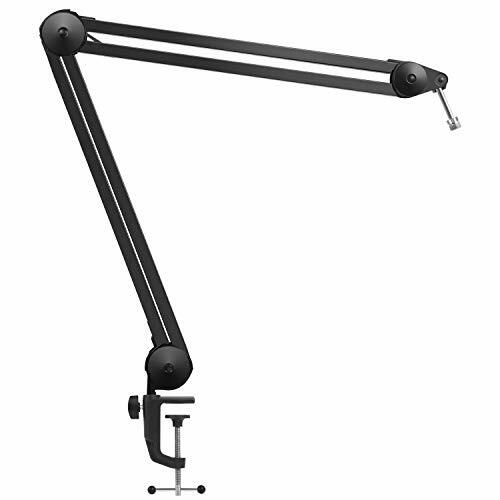 The GFW-MIC-0822 includes a 27 telescoping boom arm, twist clutch height and angle adjustment, a clip for cable management, and a no-slip, vibration-reducing gasket underneath the base. RETON commit to providing customers with Various Fashionable Bags, Luggage & Bag Accessories, Clothing Collocation, Office & Home Supplies, DIY Tools, etc. RETON are quite popular in market because of the stylish design, nice looking, high quality and fast service. If you want a nice item, RETON is a good choice. Size: about 6.7 x 6.7 x 5.1 cm / 2.6" x 2.6" x 2"
Hole diameter: about 3.8cm / 1.5"
Due to the heavy workload, the built-in cotton may be irregular in individual benchmarks. In this case, just pull up the cover and tidy up the cotton. Due to light effects and display, please allow a little bit of color difference between picture and object. If you find any parts has been missed or damaged at the first time you open the package, please contact us. - Material: Made of durable hard ABS plastic, can be used for a long time. - Built-in adjustable cotton design makes it suitable for Professional interview microphone of standard size. - Square shaped design, large place on each side to show the logo, can be engraved with PVC board by yourself or pasted by multicolored printing sticker. If you gig often, then you already know the risks and social taboos of keeping drinks near or on top of your gear. The Gator Frameworks single cup beverage holder safely mounts to your microphone or drum stand, enabling quick, convenient access to your favorite beer or thirst quencher, so you ll never have to worry about spilling a single drop on your equipment again! A screw clamp secures the holder to most, common-size stands to keep vocalists, guitarists and drummers refreshed. This product designed by us can improve your experience of using the microphone. In order to provide customers with better products and services, we have been working hard. Applicable products: most handheld microphones sold on the market. 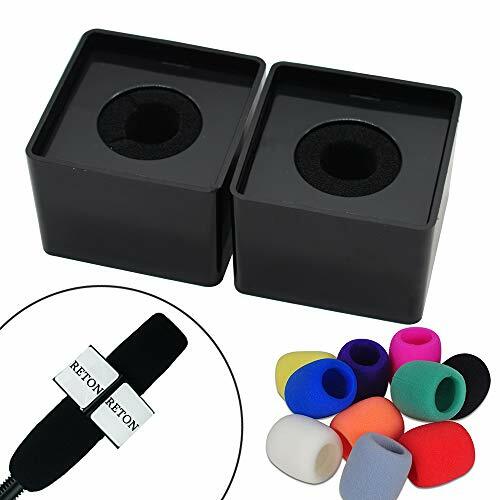 Two shockproof microphone holders: one can hold microphones with diameters less than 1.77 in / 4.5 cm, and the other can hold microphones with diameters less than 2.56 in/ 65 mm microphone. The phone and microphone in the picture are not included. The metal base can be fixed on the 2.36 in / 6 cm thick worktable and desk. The diameter of the filter is about 3.94 in/10 cm. The support arm can rotate freely 180 degrees, while the base can rotate 90 degrees. This desktop microphone stand is made of high quality stainless steel,strong and stable,rustproof,durable,and its maximum load is 1.5 kg. 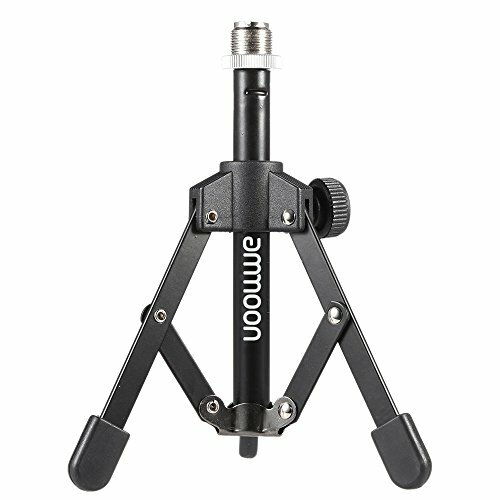 This boom arm stand supports most portable microphones on the market and can be used for two different types of microphones: one under 1.77 in /45 mm in diameter and another under 2.56 in/65 mm in diameter. This mic stand is designed with a double layer of pop filters to filter out noise,dust and bacteria and perfectly retain your voice. There is a large cell phone holder at the top of the microphone stand that can support a 14 cm-wide device and fit most phones,which means you can keep your hands free and have a steady video recording without trills. Easy to install,light arm,especially flexible,and the height and angle of the bracket can easily be adjusted to meet your needs. 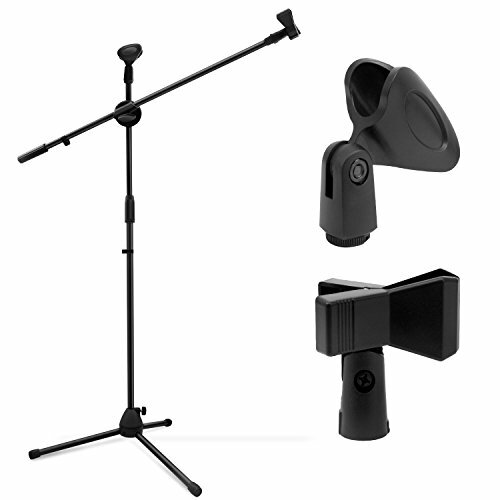 Styled in a black finish, the On-Stage MSA9030-6B is a 6" gooseneck that provides flexibility when recording up close or in hard-to-reach places. It comes with solid-steel 5/8"-27 male and female threaded ends and an interlocking rolled metal neck. It can support weights of up to 2.5 lb. Featuring a cast iron round base and a 16.5 inch long boom arm, this height adjustable desktop microphone stand is great for YouTubers and podcasting. While the height ranges from 16 to 25.5 inch, the 2.7 pound 6.3 inch wide cast iron round base provides substantial balance and stability for microphones and helps to prevent it from being knocked over. An attached ring holder on the shaft organizes the microphone cord neatly and prevents it from tangling together. Height adjustable range: 16" to 25.5"
Hold the lower part of the shaft (This is very important! It's difficult to unfasten the clutch if you hold the upper shaft) , unfasten the clutch by tuning it counterclockwise, pull the upper shaft to adjust the height, then turn the clutch clockwise to fix the height. Brand: Tetra-Teknica | Manufacturer: SFT, Inc. 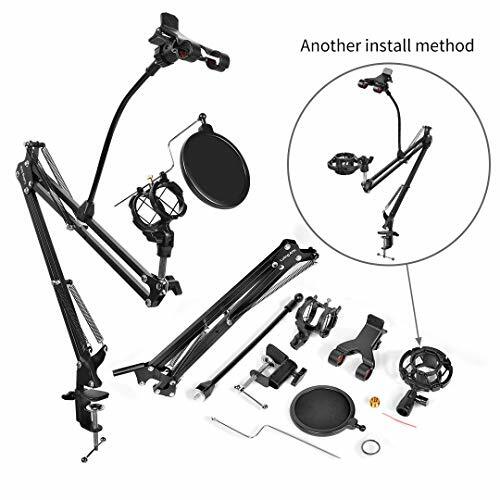 The suspension boom scissor arm stand :two size of microphone holders, one can hold 1.77''( 45 mm) diameter microphone and the other one can hold 2.56'' (65 mm) diameter microphone. 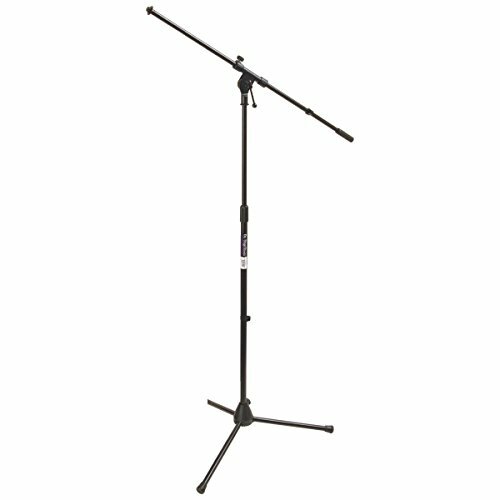 Heavy duty mic stand compact microphone stand designed for heavy duty carry, the max load: approx 1kg to 1.5KG and the adjustable boom arm can be adjusted to the suitable angle and height. 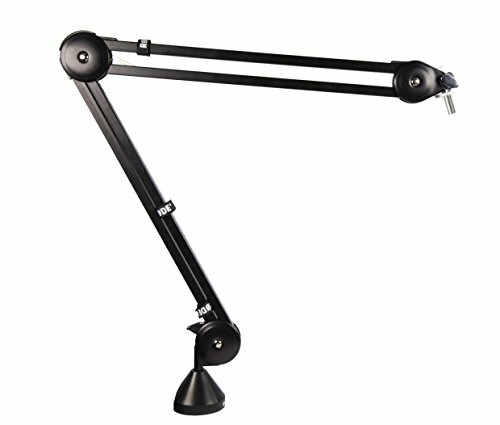 The desk microphone boom arm stand can support most phone holder,and the top can support devices up to 14 cm wide equipment. 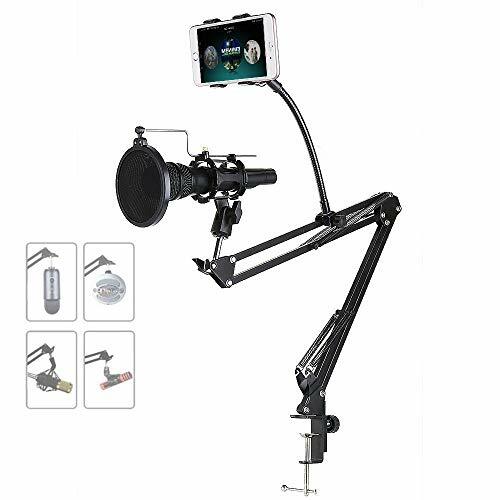 Adjustable tablet microphone stand,this mount clamp is more sturdy to bear heavy duty microphone for long. 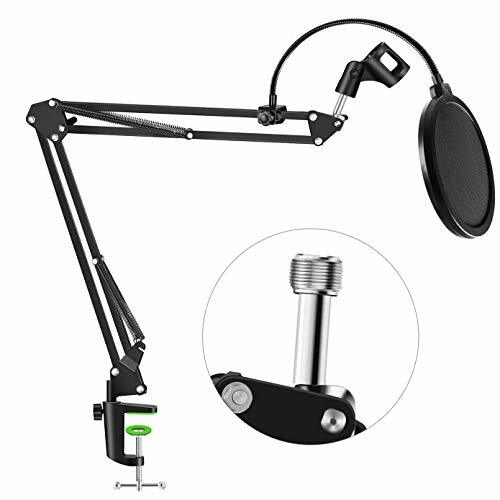 Wider mouth up to 1.77/4.5 cm to fit most desktop .dual suspension springs on each boom arm and with mic pop filter ,very stable, easy to install and easy to carry. Microphone Shock Mount Holder Clip:More than others microphone stand on the market, we are more equipped with a shock mount holder,the fits microphone diameter ranging from 40 mm-55 mm ,PLEASE VERIFY your microphone size BEFORE ORDERING! 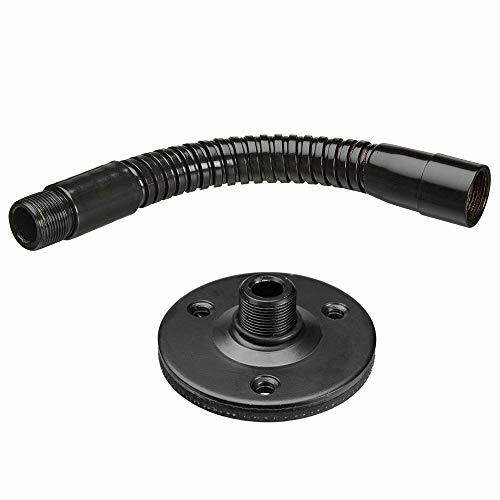 The shock mount is one of the most important recording accessories, which can effectively reduce the vibration caused by vibration. It can effectively reduce the vibrato caused by vibration, making the recorded sound effect more relevant and realistic. This is a very nice shock mount for most large diaphragm condenser microphones. Perfect for desktop and podium use. 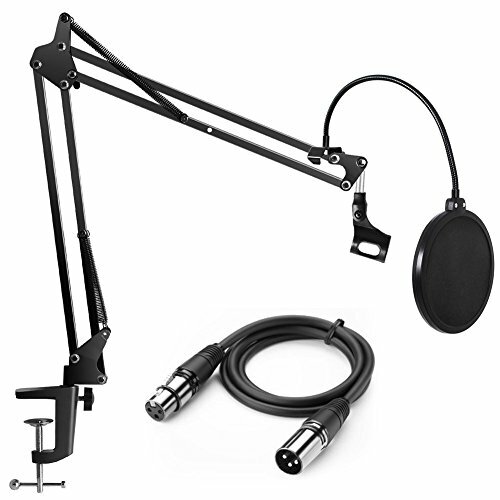 Adjust microphone quickly, easily and quietly with gooseneck shaft. California Prop 65 Warning: This product contains chemicals, including lead, known to the State of California to cause cancer and birth defects or other reproductive harm. Wash hands after handling.